Eltee Pulsitron mdl. TR20 Die Sinker EDM Machine s/n 829 w/ Eltee Pulsitron Controls, EP30/RD Power Unit, System 3R Tooling Head, 6” x 8” Travels. Eltee Pulsitron mdl. 760-10 Die Sinker EDM Machine s/n 7056 w/ Pacific Controls 25 Power Unit, Sony DRO, System 3R Rotary Tooling Head. Autojectors mdl. TH-200 200 Ton Vertical Plastic Injection Molding Machine s/n AJ0002516-0998 w/ Autojectors PREH FTF 122 CNC Controls, 16” x 16” Platen Size Between Posts. 1995 Arburg Allrounder 221M-350-75 75 Ton CNC Plastic Injection Molding Machine s/n 164337 w/ Arburg Multronica CNC Controls, 8 ¾” Mold Size Between Posts, Autoload Vacuum Loader. 1990 Arburg Allrounder 221-55-250 25 Ton Plastic Injection Molding Machine s/n 148436 w/ Arburg Controls, 8 ¾” Mold Size Between Posts. Dri-Air Industries mdl. Arid-X 35 Dual Hopper Dryer s/n D10100. Advantage Sentra mdl. S-925-21CIX Temperature Controller s/n 26717. Advantage Sentra mdl. S-925-21CI Temperature Controller s/n 5229. Temptek mdl. CP-1A Temperature Controller s/n 93282. Tsugami mdl. TUG-300 10 ½” x 12” Cylindrical Grinder s/n 52006 w/ Motorized Work Head, Center. Toyoda Type GU28-50 12” Cylindrical Grinder s/n R9989 w/ Motorized Work Head, 8” 3-Jaw Chuck. Harig “618 Automatic” 6” x 18” Automatic Surface Grinder w/ Harig Controls, Acu-Rite DRO, Walker Fine-Line Electromagnetic Chuck, Coolant. Max-O mdl. KGS-200 8” x 15” Surface Grinder s/n 800236-9 w/ Walker electromagnetic Chuck (NO CONTROLLER). Boyar Schultz mdl. 612H 6” x 12” Surface Grinder s/n HT5244 w/ Electromagnetic Chuck. Boyar Schultz 6” x 12” Surface Grinder w/ Magnalock Electromagnetic Chuck. Rivett Tool and Cutter Grinder. Sunnen mdl. MBH-1290 Honing Machine s/n 1961. Warner Swasey / Giddings & Lewis CNC Vertical Turret Lathe s/n 501-0034 w/ Fanuc Series 15-T Controls, 8-Station Turret, 25-2500 RPM, 40Hp Motor, 15” 3-Jaw Chuck. Star KNC-32 Twin Spindle CNC Screw Machine s/n 006362 w/ Fanuc 0TT Controls, (2) 10-Station Live Turrets, Main and Sub Spindles, Coolant. 1999 Kia Super Kia Turn 15 CNC Turning Center s/n SKT15065 w/ Yasnac Controls, Tool Presetter, 12-Station Turret, Hydraulic Tailstock, Parts Catcher, Chip Conveyor, LNS Hydrobar Hydraulic Bar Feed, Coolant. 1998 Haas HL-2 CNC Turning Center s/n 61676 w/ Haas Controls, 10-Station Turret, 4000 RPM, Hydraulic Tailstock, Rigid Tapping, Quick Code, Delta/ WYE, 1mb Extended Memory, Chip Auger, 16C Collet Nose, Coolant. Hyundai HiT8S CNC Turning Center s/n 6-059 w/ Siemens Sinumerik Controls, Tool Presetter, 8-Station Turret, Parts Catcher, 5C Collet Nose, Coolant. Seibu “Twin 20/30B” Dual Spindle Cross Slide Lathe s/n 4-71316-4 w/ (2) Fanuc System 3T Controls, (2) 6” x 15 ¾” Tables, (2) 5C Collet Noses. 2000 CNC Enhancements “Autobar 300” mdl. AB-300 Automatic Bar Loader / Feeder s/n 155. 1996 Mitsubishi CX20 CNC Wire EDM Machines/n 55Y20676 w/ Mitsubishi CNC Controls, 23” x 20 ½” Work Area, Filtration System, Cooling System. 1990 Mitsubishi mdl. DWC-110H CNC Wire EDM Machine s/n 5911K888 w/ Mitsubishi CNC Controls, Filtration Unit, Cooling Unit. 1992 Mitsubishi mdl. DWE-90SB CNC Wire EDM Machine s/n 529SB346 w/ Mitsubishi CNC Controls, Filtration Unit, Cooling Unit. 1999 Euromac CX1000/30 30-Ton CNC Punch Press s/n 3MM387907A w/ Euromac CNC Controls, Ball Top Table, Light Curtain. 1999 Euromac CX1000/30 30-Ton CNC Punch Press s/n 3MM317903T w/ Euromac CNC Controls, Ball Top Table, Light Curtain. 1992 Amada LCE-655 CNC Laser Contour Machine s/n 66550016 w/ Fanuc Series 0-L Controls, Amada OVS-1100 Sub Controller, Fanuc Laser-Model C1500 Laser, Koolant Koolers Cooling Unit, Slug Conveyor, 60” x 90” Ball Top Table. Geminis mdl. GE-1000S Large Bore 39 ½” x 87” Geared Head Gap Bed Lathe s/n 5598 w/ 20” Dia. Thru Spindle Bore, Newall DP700 DRO, 8-590 RPM, Electronic Motor Speed Controller, 49” Swing Over Gap, Inch/mm Threading, Tailstock, Aloris Tool Post, 39 ½” 4-Jaw Main Chuck, 35 ½” 4-Jaw Rear Chuck. Kingston “Oil Country 30” mdl. HK3000 Large Bore 30” x 118” Geared Head Lathe s/n SO3680912 w/ 12 ½” Dia. Thru Spindle Bore, Newall DP700 DRO, 5-300 RPM, 20Hp Motor, AC Tech Motor Speed Controller, Inch/mm Threading, Taper Attachment, Tailstock, Aloris Tool Post, (2) 24 ½” 4-Jaw Chucks. Monarch mdl. 612 Size 2516-96 25” x 112” Lathe s/n 47967 w/ 12-1500 RPM, Inch Threading, Tailstock, 15” 4-Jaw Chuck. 2000 Kingston mdl. HD-2290 22” x 90” Geared Head Gap Bed Lathe s/n CH00820 w/ 4” Bore Thru Spindle, 13-1200 RPM, Inch/mm Threading, Taper Attachment, Tailstock, 15 ½” 3-Jaw Chuck. Kingston mdl. 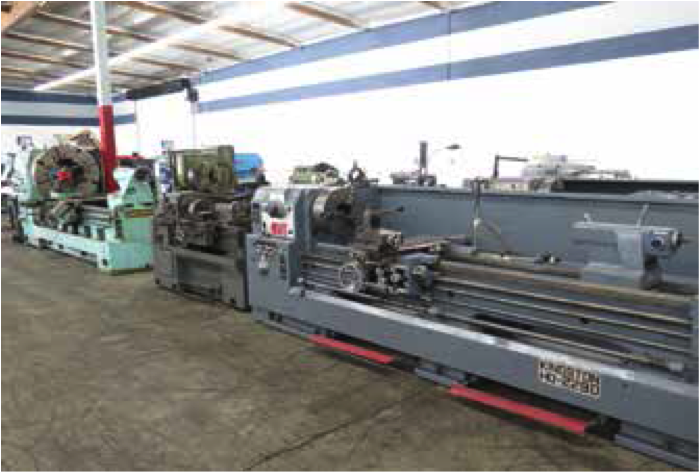 HLC-2160 21” x 60” Geared Head Gap Bed Lathe s/n 950273 w/ 17-1500 RPM, Inch/mm Threading, Taper Attachment, Tailstock. Kingston mdl. HLC-2160 21” x 60” Geared Head Gap Bed Lathe s/n 45226 w/ 17-1500 RPM, Inch/mm Threading, Taper Attachment, Tailstock, Steady Rest, 13” 3-Jaw Chuck. Acra Turn mdl. LC-1340G 13” x 40” Geared Head Gap Bed Lathe w/ 60-2000 RPM, Tailstock, Steady Rest, 6” 3-Jaw Chuck. LeBlond Regal Servo-Shift 14” x 32” Lathe s/n 4B1865 w/ 45-1800 RPM, Inch Threading, Trava-Dial, KDK Tool Post, 5C Collet Closer. Cadillac 14” x 28” Lathe s/n 057618 w/ 83-1800 RPM, Inch Threading, Tailstock, 5C Collet Closer. LeBlond Regal Lathe s/n 2B1173 w/ 45-1800 RPM, Inch Threading, Tailstock, 10” 4-Jaw Chuck, Coolant. Hardinge mdl. TFB-H Wide Bed Lathe s/n HLV-H- 5207K w/ 125-3000 RPM, Tailstock, Power Feeds, 5C Collet Closer. Hardinge DSM-59 Second OP Lathe w/ 5C Collet Closer. Lin Huan mdl. LHT-25B Second OP Lathe s/n 682701 w/ 460-1850 RPM, 6-Station Turret, Cross Slide, 5C Collet Closer. MSC Vertical Mill w/ Mitutoyo DRO, 2Hp Motor, 80-2760 RPM, Chrome Ways, Power Feed, 9” x 49” Table. Bridgeport Vertical Mill s/n 182434 w/ Sargon Prospector DRO, 2Hp Motor, 60-4200 Dial RPM, Power Feed, 9” x 42” Table. Bridgeport Series 1 – 2Hp Vertical Mill (NEEDS WORK). IVAC mdl. X52K Vertical Mill s/n 750187 w/ 30-1500 RPM, 50-Taper Spindle, Power Feeds, Box Ways,1250mm x 320mm Travels. 1991 Accurshear mdl. 613510 .135” x 10’ Hydraulic Power Shear s/n 1348 w/ Accurshear Controlled Back Gauge, Stroke Control, Squaring Arm. Peddinghaus mdl. 210 Super 13 Ironworker s/n 536C250. Amada D-760 30-Ton Duplicator Punch Press s/n 701980 w/ Pneumatic Sheet Grabbers, 36” x 48” Template Table, Ball Top Tables. Strippit “Super 30/30” 30-Ton Fabricator Punch Press s/n 53693065. Heim mdl. 16A-OBI-BG Stamping Press s/n 2841 w/ 31” x 50” Bolster Area, 23 ½” x 31 ½” Ram Area, Pneumatic Clutch. Timesavers mdl. 119M1 19” Belt Grainer s/n 9724 w/ Belt Feed. Finn-Power Hydraulic Hose Crimping Machine. Coolant, MMK Tecnara Type MD400R 4th Axis 16” Rotary Head. Chiron FZ26L Sliding Bridge CNC Vertical Machining Center s/n 135-22 w/ Fanuc Sinumerik System 6 Controls, 30-Station ATC, 40-Taper Spindle, 24 ¾” x 275 ½” Table, Coolant. Chiron FZ22L Sliding Bridge CNC Vertical Machining Center s/n 175-75 w/ Fanuc System 0M Controls, 40-Taper Spindle, 18 ¾” x 181” Table, Chip Conveyor, Coolant. Shibaura BMC-8B 4-Axis CNC Horizontal Machining Center s/n 210669 w/ Tosnuc 500 Controls, 30-Station ATC, 45-Taper Spindle, 4th Axis Thru 31 ½” x 31 ½” Table, Coolant. 1997 Haas VF-4 4-Axis CNC Vertical Machining Center s/n 11287 w/ Haas CNC Controls, 20-Station ATC, CAT-40 Taper Spindle, 7500 RPM, 15 HP High Torque Motor, Brushless Servos, Programmable Coolant Nozzle, Quick Code, Rigid Tapping, Floppy Disc, Chip Auger, 18” x 52” Table, Coolant, (NEEDS SPINDLE DRIVE CONTROL UNIT). Ooya RE-IMVL CNC Vertical Machining Center s/n VL2109019 w/ Fanuc 11M Controls, 36-Station ATC, CAT-40 Taper Spindle, 23 ½” x 82 ½” Table, Coolant. Mazak VQC-15/40 CNC Vertical Machining Center s/n 77094 w/ Mazatrol M-32 Controls, 16-Station ATC, 40-Taper Spindle, 16” x 35 ½” Table, Coolant. Hitachi Seiki VA40-40 CNC Vertical Machining Center s/n VA-4382 w/ Fanuc System 6M Controls, 25-Station ATC, 15 ½” x 49” Table. Excel PMC-5V CNC Vertical Machining Center w/ Fanuc Series 0-M CNC Controls, 16-Station ATC, 40-Taper Spindle, 5000 Max RPM, 17” x 27 ½” Table, Coolant. Axxiom mdl. MC-12610 CNC Router s/n 0013 w/ Fanuc System 0M Controls, 6-Station ATC, 3000-20,000 RPM, 23 ½” x 47” Table, Vacuum Top Plate. 2010 CompAir Type 175-9A 75 kW Air Compressor s/n CD10001566002 w/ CompAir Delcas 3100 Controls. Mattei mdl. EM250 25Hp Rotary Vane Air Compressor s/n 8S41599. Curtis mdl. 5HT8-A3 5Hp Horizontal Air Compressor w/ 3-Stage Pump, 80 Gallon Tank. Janome mdl. JR500 CNC Desktop Robotic Table s/n 97JR00878 w/ Skycompo Automatic Soldering Unit. DoAll mdl. C-916 9” x 16” Horizontal Band Saw s/n 527-072053 w/ Manual Clamping, Coolant. DoAll mdl. 2013-V3 20” Vertical Band Saw s/n 572-07230 w/ 30-5500 Dial FPM, 26” x 26” Miter Table. DoAll mdl. 1612-1 16” Vertical Band Saw s/n 148-62508 w/ Blade Welder, 50-5200 Dial FPM. KBC mdl. 360 14” Vertical Band Saw w/ Blade Welder. Donaldson Torit mdl. DF02-2 Dust Collector s/n 2674024-002 w/ Donaldson Delta-P Controls. Thermo Fisher Scientific “Harris ELT Series” mdl. ELT-21V-40A41 Ultra Low Temperature Freezer s/n 0128462901090806. Thermo Products Solutions Lunaire mdl. CEO917-3 Environmental Chamber s/n 0803000058 w/ 0-99 Deg C Range, Temp and Humidity Controls. Thermo Products Solutions mdl. DC-1406-F-ST350 350 Deg C (662 Deg F) Lab Oven s/n 0808000071. Schreiber mdl. 200AC Process Chiller s/n 2023. Loctite Zeta 7610-UV Ultraviolet Curing Station. (2)Buehler “Ecomet III” Precision Lappers. 2008 Airflow Systems mdl. DT3000V2-BF1-PG6-ST-MS 40” x 65” Down Draft Table s/n 1030947. WMW mdl. BS32AI Power Drill s/n 15927 w/ 63-1000 RPM, 9-Speeds, 18” x 22” Table. Sergeant mdl. 1620C/STDY HT 16” x 20” L-Sealer s/n 029506. (2)ETQ mdl. TG60H12 6000 Watt Gas Generators. (2)ETQ mdl. TG4000 4000 Watt Gas Generators. (5)ETQ mdl. TG32P31-01 3200 Watt Gas Generators.